As I promised in my latest post, here a second option for your “Italian Style” Christmas Eve Menu. The dish I’m suggesting to you this time is EASY, SUPER FAST, but not exactly inexpensive. In fact, it is just a simple pasta, dressed with a sauce made with a little bit of olive oil and onion, and the main ingredient is Smoked Salmon (which, you know, is usually not cheap!). It could be a perfect “last minute choice,” just because of the few ingredients you need, and also because in 20 minutes it will be ready! The preparation of the sauce takes about the time for the pasta to be cooked, so you don’t need to do anything in advance. The all steps will take not more than 20 minutes. Put the water in a big pot at medium heat. In the mean time, cut the smoked salmon in small pieces. In a big pan cook the chopped onion in the olive oil at medium heat. When the onion starts to become “golden” (do not let it become “brown”! ), add the salmon. (If the water has started to boil, don’t be afraid to pour in the pasta: the sauce is almost ready!). As soon as the salmon change its color (from “orange” to “light pink”), add the cream cheese, and stir until it melts completely. Turn off the heat. As soon as your tagliolini is ready, dry them very well but set aside few tbs. of the hot water to mix with the sauce that probably has become a little too much thick. Mix the tagliolini into the sauce pan at low heat for a couple of minutes, stirring very well to spread the sauce evenly. Your fancy entree is ready! If you wish to present your dish in a very special way, few minutes before the pasta is done, make small roses with few salmon slices (it takes just few seconds and with smoked salmon it is pretty easy), and parsley leaves, and create a gourmet plate! 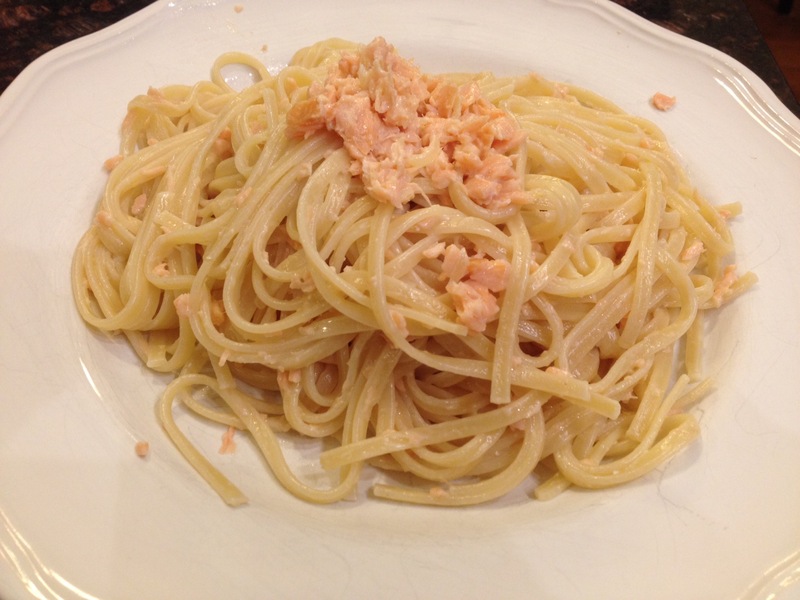 – I can easily recall that my grandmother, to save some money (and salmon), used to prepare this recipe with half salmon and half ham: since the ham’s taste is not too strong, it doesn’t cover the salmon taste, and so you can have a salmon pasta, using half quantity of salmon! Honestly, my husband likes even more a little touch of ham (I use the “Traditional” one), so usually I make this pasta using both salmon and ham. – This recipe is perfectly suitable also for the taste of the younger… my daughters (8,6 and 4 years old) adore it! It would really make me feel proud knowing you intend to try this entrée as your Christmas Eve’s meal first course, but even if you’ll not, or if you decide to try it on a different day it doesn’t matter! What matters it that you’ll like it! And if you do, please share it, like it, leave a comment, subscribe to receive every week one new recipe for free, and help support my blog! Hello! This is a very simple and fast recipe. Thank you! Is the dish supposed to be very creamy? Not necessary, it depends on how much cream cheese (or “panna da cucina” you use, and how much water from the pasta you add to the sauce. Honestly it tends to get pretty dry if you don’t add anything liquid. Thank you! Was asking because I had the dish at a restaurant and it wasn’t as creamy as I would have liked. I like very creamy pasts. Haha. Sure! I love questions from my reader! Never hesitate to comment!